Several weeks ago, in the dark basement of a music club in Madrid, Spanish filmmaker Nacho Vigalondo whispered a name in my ear, the person he hoped would be the star of his latest film, and then he quickly swore me to secrecy in exchange for a beer. Well, now that name can be shared over beers everywhere. 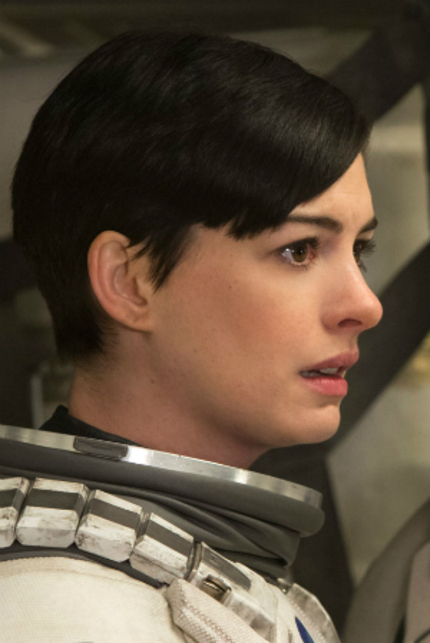 Anne Hathaway (of whom I have become a big fan in recent years) will take the lead in Colossal, written and directed by Vigalondo, and produced by Nahikari Ipiña with her company Sayaka Productions, financed by Voltage Pictures. Hathaway will play Gloria, who moves back to her hometown after losing her job and fiancé. Suddenly, a Godzilla-like creature begins to attack Tokyo, and somehow Gloria has a psychic connection with the events. How is this possible? Maybe she isn't as inconsequential as she thinks. Most readers know of my great love for Vigalondo and Ipiña's work, and in a quote from the Hollywood Reporter article, he says: "Colossal is my most ambitious script so far, and probably the most personal one. Having Anne and this terrific team around goes beyond my wildest expectations." I can attest to the quality of the script, and other fans of his previous films Timecrimes, Extraterrestrial and Open Windows will know how Vigalondo always pushes the boundaries of science fiction cinema, both from a narrative and aesthetic perspective. For those attending the Marché du Film at Cannes, Voltage Pictures is launching the project for foreign buyers. The rest of us will just have to wait, hopefully not for too long. (And maybe if I buy Nacho a beer, he'll let me visit the set and write an article about it). Hey LA! Win Tickets To The LA Premiere Of Nacho Vigalondo's COLOSSAL!